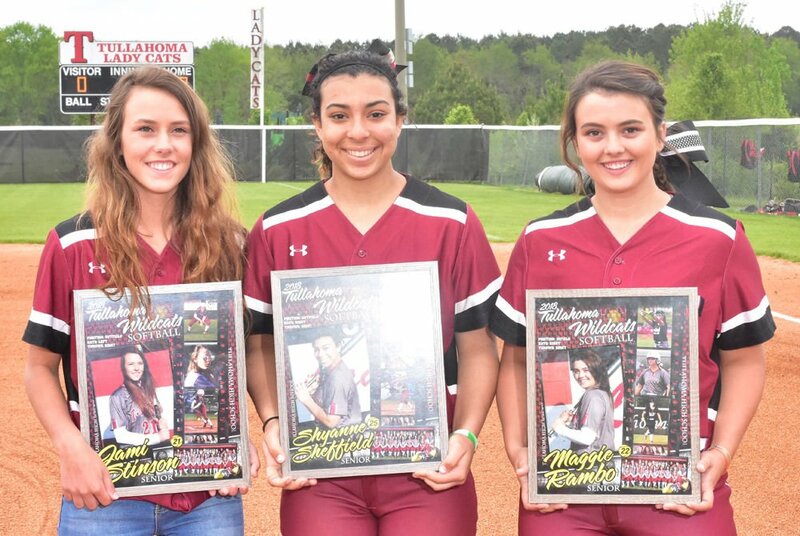 Before taking on Coffee County on Wednesday night, the Tullahoma High School softball team honored its three senior members. Those players included, from left: Jami Stinson, Shyanne Sheffield and Maggie Rambo. With a 3-1 lead heading into the bottom of the sixth inning, Tullahoma put the game away by adding four runs in the frame, going on to defeat Coffee County 7-1 at home on Wednesday night. Tullahoma and Coffee County were scheduled to play again on Thursday, this time in Manchester. However, due to weather that game has been postponed until Tuesday. First pitch is scheduled to take place at 6 p.m.
Madison Barnett delivered another strong performance in the circle for the Lady Wildcats against Coffee County. In the complete-game victory, the lefty allowed just one run on six hits and a walk while striking out three batters. Barnett was helped out by her defense a couple of times, including on a game-changing save by center fielder Shyanne Sheffield in the top of the fifth inning. With Tullahoma in front 3-0, Coffee County loaded the bases with two outs in the frame. Coffee County’s Raven Rogers got a hold of a pitch that looked destined to fall in the right-center field gap. However, Sheffield was able to get to that ball, stretching out and diving to keep the Lady Raiders off the scoreboard. “It was a game-saver,” Barfield said. “She [Sheffield] does things that just amaze you. You go back over the four years and I wish that I had sat back and enjoyed watching her play more instead of coaching. After having runners reach in both the second and third innings, Tullahoma was able to get on the scoreboard with a three runs in the bottom of the fourth. Demi Garner and Barnett led off the inning with back-to-back singles for the Lady Wildcats. Erin Douglas came in as the courtesy runner for Garner, while Staisha Sims came into run for Barnett. Jenna Jones followed with a hard ground ball to first base and reached due to an error by Coffee County. Both Douglas and Sims were able to score on the same play, giving Tullahoma a 2-0 edge. Lila Saunders followed by grounding into a fielder’s choice as Jones moved up to third base. Maggie Rambo grounded out in her at-bat, but Jones was able to score the third run of the inning. Coffee County struck with a run in the top of the sixth inning, when Lauren Tomberlin doubled to start the frame. Tomberlin later scored after Shelby Scrivnor grounded into a fielder’s choice, cutting the score to 3-1. Tullahoma countered with four runs in the bottom of the sixth to take a commanding 7-1 advantage. Rambo, Meghan Prosser and Sheffield all reached on one-out singles, loading the bases. 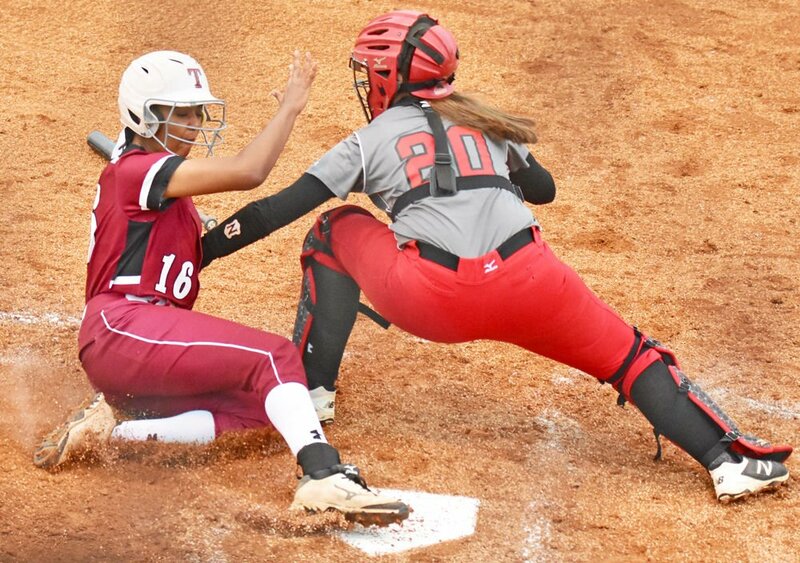 Tullahoma’s Staisha Sims slides into home, scoring a run against Coffee County in the bottom of the fourth inning on Wednesday. The Lady Wildcats went on to defeat the Lady Raiders 7-1. Rambo was able to score on an error in the next at-bat, while Prosser advanced to third base and Sheffield took second. Jessica Edde followed with a two-run double to center field that scored Prosser and Sheffield, making the score 6-1. Two pitches later, Garner added an RBI double of her own to center field, plating Edde for the Lady Wildcats’ final run of the night. Keri Munn led off the top of the seventh with a single for Coffee County. However, Barnett retired the final three Lady Raiders in order, as Tullahoma recorded the victory. Munn also made the start in the circle for Coffee County, allowing seven runs, six of which were earned. She also surrendered eight hits and three walks while striking out six batters. The Lady Wildcats are slated to host three-straight home games starting with Lincoln County on Friday at 6 p.m. Tullahoma will then take on Huntland on Saturday at 12 p.m. and host Lawrence County on Sunday at 3 p.m.